Truck accident claims are used to establish liability on the part of commercial drivers who cause traffic collisions. These claims can also be brought against freight companies that employ or supervise negligent drivers. Because injuries to the occupants of passenger vehicles tend to be severe in these cases, commercial operators must carry insurance policies with policy limits much higher than is required for regular vehicles. This increases the likelihood that an injured party who establishes liability will be able to collect full compensation. Experience matters when it comes to choosing a truck accidents lawyer. Based in Manchester, NH, attorney John B. Kenison, Jr. and his assistant Lisa Hamilton Mills have approximately 60 years of combined experience in the legal field. You can request help with your case now. Truck accidents can be complex because the industry is governed by state and federal regulations. A truck accident lawyer can navigate these laws and meet with trucking experts to recreate the scene of the accident to better determine liability. 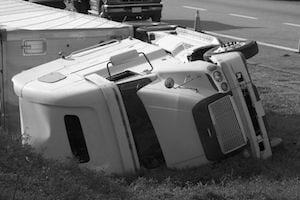 Identifying the cause of a collision is an essential step in building a truck accident case. Kenison Law Office can determine how your accident happened and then present the information in a way that is easy for an insurance adjuster or a jury to understand. A loaded tractor trailer may weigh up to 80,000 pounds and measure 75 feet or more in length. The typical passenger car, on the other hand, may weigh 4,000 pounds and measure 15 feet. All across New Hampshire’s roadways, these two very different kinds of motor vehicles must safely navigate around each other, often at highway speeds. Add winter weather, construction zones, or other hazards into the mix, and the situation becomes all the more precarious. Kenison Law Office can determine how your accident happened and then present the information in a way that is easy for an insurance adjuster or a jury to understand. Besides increasing the likelihood of an accident, the size discrepancy between trucks and passenger vehicles explains why injuries in these cases are often so catastrophic. It is simply a matter of physics. When a collision happens, it puts the bodily safety of the smaller vehicle’s driver and passengers at great risk. Mr. Kenison is also a wrongful death lawyer. He has witnessed the tragic consequences of truck crashes on many occasions in this capacity. His compassion and legal acumen come as a comfort to truck accident victims in difficult times. When a truck driver causes an accident in the course of his or her employment, the injury victim can bring a negligence claim against the driver. This is known as direct liability. It is based on the idea that individuals are responsible for their own conduct. The victim can also bring a claim against the trucking company in this situation. This is known as vicarious liability. It is based on the idea that an employer is responsible for harm caused by subordinates whose services the employer controls and benefits from. People are accustomed to the idea of vicarious liability in everyday life. For example, if a grocery clerk fails to clean up a spill, a customer who slips and falls can bring a claim against the grocery store. The same principle applies when the employee of a trucking company causes a traffic accident. Note that the trucking company is not being held liable for its own wrongdoing. Rather, it is being held secondarily liable for the driver’s wrongdoing. What many people do not realize is that a trucking company may also have acted improperly in its own right, giving rise to a separate direct liability claim against the company. Examples include negligent hiring, failure to properly train, and disregard of safety regulations. Professional truck drivers and their employers want to be viewed as safety-conscious, even when that is not the case. Attorney John Kenison will fight to hold all responsible parties liable. Contact our office for help with your trucking accident injury.